Resource shortages, population growth, and climate change are just a few of the critical problems facing society today. The solutions will require the best that science and technology can offer, and GIS is an essential tool for those solving many of these pressing issues. Many opportunities exist for GIS training in the United States, but this is not always the case in developing countries, especially for those working in conservation-based organizations. To help address this deficiency, Esri Silver Tier Partner Juniper GIS of Bend, Oregon, and the Society for Conservation GIS (SCGIS) have joined forces to strengthen GIS capacity among conservationists around the world with their Train the Trainer (TTT) program. 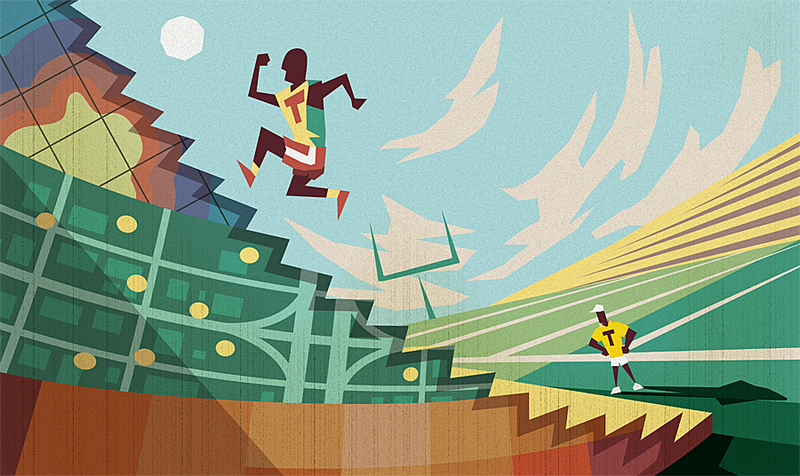 The challenges in underdeveloped countries include access to the technology and expertise to implement these tools. Over the past 10 years, hardware and software pricing have come down due to economy of scale and market competition, and the Esri Conservation Program has gone a long way toward making the software easily accessible to qualified conservation groups. But the challenges of finding competent personnel to implement and take advantage of these advances in technology still remain. Since 1997, SCGIS has been providing intensive GIS training in the United States to 15 to 20 international participants (Scholars) from around the world each summer. While this is a very successful program, there is still a need to provide a cost-effective method to grow capacity for hands-on GIS training in environmental and conservation applications, especially in developing countries. The TTT program is one option to meet this need by helping future trainers develop skills and course materials for teaching GIS. This is intended to supplement and extend the SCGIS Scholars training program by providing previous scholars with the opportunity to become qualified trainers. At the end of this program, the Scholar/trainee possesses improved GIS skills, improved teaching skills, and a complete set of course materials for teaching a one-week core GIS class. Since 2009, John Schaeffer [one of the authors] of Juniper GIS, who has more than 20 years of experience using and teaching GIS, has been the lead instructor for the SCGIS Scholars program. He has developed an integrated in-depth series of conservation GIS courses that are used in the SCGIS international Scholars program, as well as other trainings. In cooperation with SCGIS, he has been working to develop other trainers to use this material in their home countries. He has also been involved with several other TTT programs funded by the National Science Foundation and other organizations. 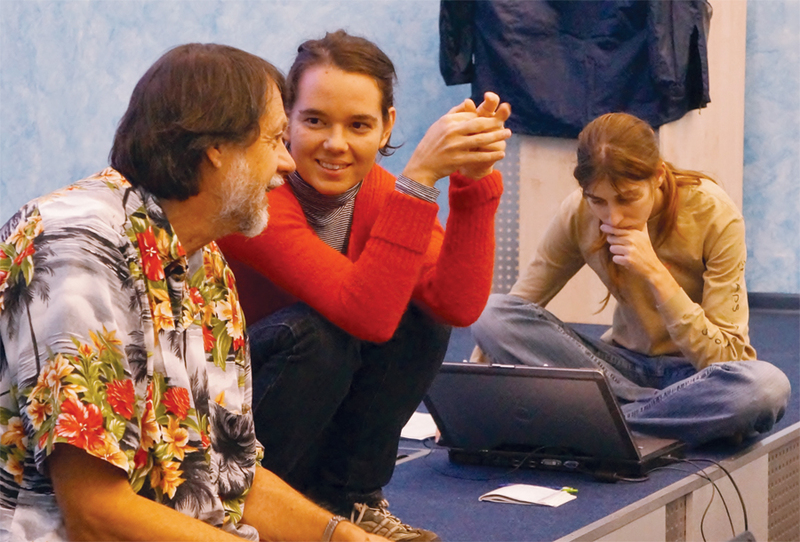 John Schaeffer discusses teaching issues with Ela Šegina as Ilona Zhuravleva prepares for her lecture at the ArcGIS for Environmental Analysis class in Moscow. The SCGIS/Juniper GIS TTT program began in 2011. SCGIS leaders established an application process and created a formal contract with the trainee to become a Juniper GIS Authorized Instructor with full access to Juniper GIS course material. The first TTT candidate was Cecilia Cronemberger, a 2009 Scholar from Brazil. During the more than two-week Scholars training program, she assisted in the class as a helper and presented lectures, and during breaks, she and Schaeffer discussed how the class and course material work, typical problems students might have and how to solve them, and classroom management. Each evening, they worked together on class preparation, teaching skills, how to design a class and develop course material, and all the other details that make for successful teaching. Upon completing the program, she was granted her Juniper GIS Instructor certificate, along with the official Juniper GIS uniform, her own Hawaiian shirt. Since her graduation in July 2011, she has taught eight classes to approximately 100 students in Brazil, greatly helping expand GIS training. In 2012, SCGIS selected Carlos de Angelo ("Carlitos"), a 2011 Scholar from Argentina, to be the TTT candidate. His training was the same as Cronemberger's, and in July 2012 he was awarded his Juniper GIS Instructor certificate and shirt. Since then, he has taught two classes to 29 students in Argentina, with several more classes planned for 2014. To expand the TTT program, in 2013 a new approach was taken, which was to send Schaeffer to the SCGIS Scholars in their home regions to provide the TTT training. This program, for two to four trainees, consists of a three-day advanced GIS class for the trainees and GIS users from local conservation groups, a five-day ArcGIS for Environmental Analysis (AE) class in which the trainees served as helpers and gave some presentations, and three to four days during which Schaeffer and the trainees work together on teaching skills and issues. After reaching out to the SCGIS International Chapters, Schaeffer and the SCGIS International Committee chose SCGIS Russia from among several offers, for this first effort. SCGIS provided $2,500 to help pay for Schaeffer's airfare and expenses. SCGIS Russia, especially Ilona Zhuravleva and Anna Komarova, in cooperation with Greenpeace Russia, where they both work, organized training facilities and home stays for Schaeffer and another trainee in Moscow. By keeping all the activities in Moscow and having home stays, this program was affordable. 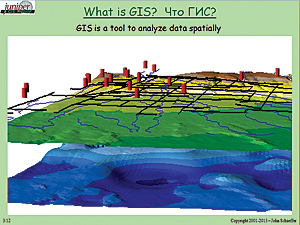 A slide used in the Introduction to GIS course, with some Russian titles added. 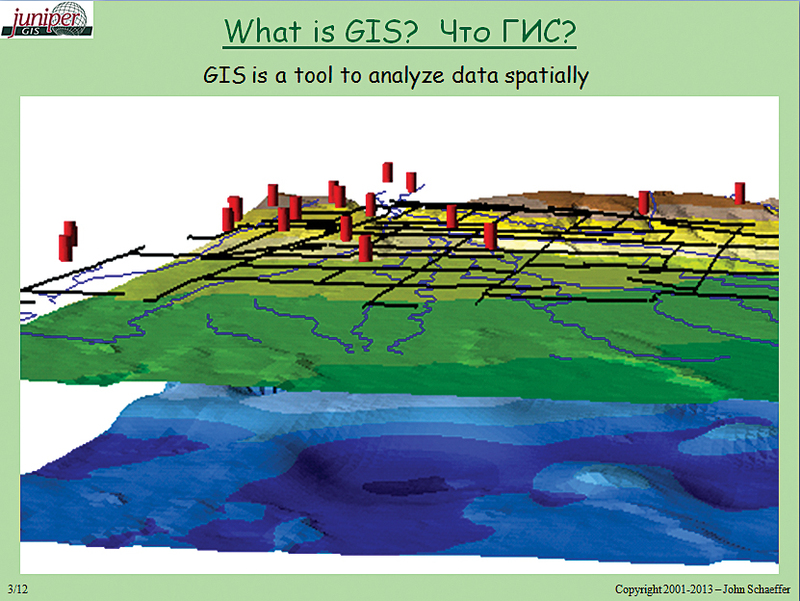 The trainees will have access to all the Juniper GIS PowerPoints to use when teaching their own classes. Three trainers were chosen for this program: Ela Šegina, a 2013 Scholar from Slovenia; Zhuravleva, a 2011 Scholar from Russia; and Kamarova, a 2012 Scholar also from Russia. They are all now authorized Juniper GIS instructors who have received all the Juniper GIS supplied teaching materials needed to teach the ArcGIS for Environmental Analysis course, plus a variety of introductory and intermediate-level courses. Eventually, these instructors will adapt this course to their own needs and with their own data, but a very important result of this program is they have a complete set of course materials and are familiar enough with the class to teach it right now. The two previous TTT Scholars, de Angelo and Cronemberger, have been teaching two or more classes each per year to about 25 to 30 students. With five Scholars who have now completed the TTT training, one should easily expect to have at least 100 new students learning conservation GIS each year because of these efforts. Because this program used two classes as part of the teacher training, 23 people in various levels of conservation GIS were also trained. The three former Scholars recently trained in Russia are now ready to teach the AE class, both in terms of their skills and having the material. As they gain experience and confidence, they will add more classes to their repertoire, with the continuing support of Juniper GIS for teaching material. Over the next five years, we would expect to have as many as 300 or more people learning how to use GIS in conservation applications from these three new instructors, which is quite a multiplier effect. 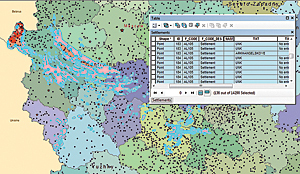 In the first exercise, students see how GIS can be used by doing some simple analysis. 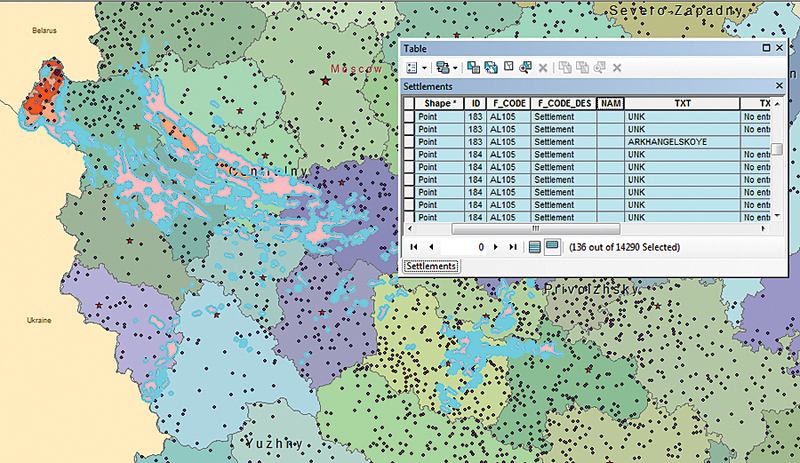 In this example, students selected areas with high radiation near Chernobyl and then found which settlements were inside these areas. It was very important that the trainees had been through the SCGIS/Juniper GIS course for the SCGIS Scholars so they were familiar with the material in the AE class, were familiar with working with Schaeffer, and that he knew their strengths and weaknesses. This allowed him to concentrate on teaching how to be effective trainers and not worrying about their GIS skills. The other important part of this program is that Juniper GIS is willing to share its tried and tested conservation GIS training material with these instructors so they can concentrate on training and not on having to write and update material. Anyone who has developed courses knows how time-consuming this can be. While it might not always be possible to do a program like this for so little money, even at three to four times the cost, this program provides an incredible value and goes a long way toward increasing opportunities to learn GIS outside the United States, where this is needed most. John Schaeffer is the lead instructor, consultant, and analyst for Juniper GIS Services and has more than 21 years of experience working with and teaching GIS and related technologies to a wide variety of audiences. In 1994, he started one of the first two-year GIS programs in the United States at Central Oregon Community College. He has also been the lead instructor for the Society for Conservation GIS Scholars program for several years and teaches for many conservation groups all over the world. He is also a GIS Professional (GISP) as certified by the GIS Certification Institute, an Esri Certified Instructor, an Esri Certified Desktop Associate, and a CTT+ (Certified Technical Trainer). Karen Beardsley, PhD and GISP, serves as managing director for the Information Center for the Environment in the Department of Environmental Science and Policy at the University of California, Davis. She has more than 25 years of experience working with GIS in the management of natural resources, land use, and environmental information for the UC Davis Information Center for the Environment and international conservation organizations. Since 2010, she has coordinated the SCGIS Scholar Training in Davis, and in 2013 she became a certified Juniper GIS instructor. For more information, contact John Schaeffer and Karen Beardsley.